Secret Golf's Steve Elkington visits legends of the 1951 Ryder Cup, player Jackie Burke and caddy Willie McRae. He also has a SECRET SMACKDOWN with 6 time European Ryder Cup Team Member, Peter Oosterhuis at Pinehurst #2. [MUSIC PLAYING] WILLIE MCRAE: Father, we don't make the only mistake on this journey. Father, the road, the rough, the going gets tough, but the hills are so hard to climb. Thank you, God, for God is always. In Jesus name we pray. Amen. NARRATOR: Legends are defined as those who give voice to belief, and through their words and actions, silence the protests of those who do not believe. But to become legendary, one will leave permanent footprints and make virtuous the stories that will be handed down for generations to come. Join us as Secret Golf with Steve Elkington brings together two remarkable men made legendary through the stories which have lived on from an event that can be described as nothing short of miraculous. - It's a great pleasure when just two people living from the 51 Ryder Cup. NARRATOR: Along this journey, a British gentleman walks Elk through his six Ryder Cup appearances. - Just believe in your own game. Play the best you can. And see what happens. But you understand, you're not to give up. You're going to say, we have a good team, the best team we could have, and let's give it a go. WILLIE MCRAE: [SINGING] Your grace and mercy brought me through. I'm living this morning because of you. THEME SONG: It's secret golf. It's what I'm looking for. It's why I get up every morning, call my good-timing friends. It keeps me coming back for more. Secret Golf. We're headed down the road. - Point it towards that tower up there. THEME SONG: We just loaded up the big show. THEME SONG: Going looking for the heart in stone. THEME SONG: We're moving till the wheels fall off. Secret Golf. - Sh, it's a secret. NARRATOR: Two teams came together. History was made. Legends were born. No worthier arena. No grander stage. This is the story of the 1951 Ryder Cup at Pinehurst, and how a chance phone call in 2015 led to a reunion of two golf icons. When it comes to validating the significance of teamwork in the game of golf, nothing speaks more firmly than the Ryder Cup. Named after English businessman Samuel Ryder, who donated the trophy, the biannual men's golf competition between America and Europe has been a staple to golf tradition since the first matches in 1927 at Worcester Country Club in Massachusetts. Venues change as hosting countries alternate with each Ryder Cup season. Over the years, Ryder Cup matches have produced not just riveting golf outcomes under the team umbrella, but they have solidified, justified careers for the history books. Europe, who won for a third consecutive time in 2014, will defend this year at Hazeltine National Golf Club in Minnesota. Davis Love III will captain the American squad, with Darren Clarke leading the European charge. As the matches are team event, the strongest and best word to define the matchups would be strategy. An effective coach relies always on strategy. While strategy has defined every Ryder Cup, the 1951 match, 65 years ago, was remembered also for something, well, a little bit unplanned. - There's a few notable things about that 51 Ryder Cup that they played here at Pinehurst. One, they only played two-day matches. They play one day, the first day was an alternate-shot match. Then they skipped a day-- if you can believe that. They went away and went to a football game to watch here in Carolina. - And then on Sunday they came back and they played a 36-hole final. NARRATOR: Under the captaincy of Sam Snead and driven by Ben Hogan, the American team routed the Europeans that year, 9.5 points to 2.5. You can't talk about American golfing legends without including this man. Born in Fort Worth, Texas, Jackie Burke Jr. first picked up a club at the tender age of seven. A golfer, a mentor, but most of all, a great man. STEVE ELKINGTON: Jackie Burke is probably the most passionate person about golf that I've ever seen. I mean, he lives and breathes that game. NARRATOR: As a rookie in the 51 Ryder Cup, the 28-year-old then went on to claim four straight tour victories the following year. - I shot 64, 64-- 128, and I won the Texas Open. - So you jumped in the car from Texas, you drove where? JACKIE BURKE JR.: I drove to Houston. STEVE ELKINGTON: Won that one. STEVE ELKINGTON: Drove from there to? JACKIE BURKE JR.: Baton Rouge. STEVE ELKINGTON: Drove from Baton Rouge to Skip Alexander's place. JACKIE BURKE JR.: To St. Petersburg, Florida. STEVE ELKINGTON: Won that one. So now, you're on your way to Augusta. JACKIE BURKE JR.: And Snead beat me there, [INAUDIBLE] seconds. STEVE ELKINGTON: Snead beat you by one shot. Can you imagine the hype nowadays if you were going with four wins in a row going to Augusta? NARRATOR: 1956 saw Burke claim the iconic Green Jacket at Augusta, the PGA Championship title, and the prestige accolade of PGA Player of the Year. Jackie has a winning formula and is still passionate about sharing the secrets to his success. - There's a swing in everybody. Everybody has a golf swing. Everybody can dance. I don't know about singing, but I know that in motion, everybody has it. But the teachers of today are teaching methods and things that you-- they've analyzed the game too much. The swing that you have in you is what a teacher has to get out. NARRATOR: A mentor to our very own Elk, skills are now being passed down to the next generation in the Elkington family, Sammy. - The old Scottish used to say, "So ye waggle so ye play." The waggle is just a balance-- get yourself balanced. SAM ELKINGTON: Everything that he does, from the moment he wakes up til the moment he goes to sleep, he's old school. And you're just going to have to know that about Jackie Burke, is that everything that he does is the old-fashioned way. - The passion starts with being able to teach. That's what people are interested in, and not making it complicated. The passion comes from anything that you are good at, you have a passion for it. I mean, I don't have a passion for climbing that tree over there because I'm not too good at that. I wouldn't want to try that. - You know, everything today is about the 1951 Ryder Cup. There's only two of you guys left. And we brought-- we brought this man in right here, Willie McRae. - He was a caddy. He was only-- he was the only caddy left from the 1951 team. And you're the only-- only one left. You haven't seen that man in, since 1951. - Here comes Willie. Willie. STEVE ELKINGTON: We got you here, Willie. Mr. Burke's here. How are you doing, my friend? - Fine. Hello, Mr. Burke. How are you doing? JACKIE BURKE JR.: You're still at Pine-- you're the-- you're the anchor at Pinehurst. JACKIE BURKE JR.: The anchor. - They still let me stay there. NARRATOR: People whose paths are bound to cross again will always gravitate back towards one another-- no matter the lengths of their course. - Well, I'm lucky enough, as you know, to be around Jackie Burke all the time, but last year we came down here and we found Willie McRae. And we learned from the people here at Pinehurst that they wanted to do something around the 51 Ryder Cup, because it's only ever been played at Pinehurst once, and there was two people alive that were in that match. - Hello, Mr. Burke, I enjoyed caddying for you. And me and you the only two living from the 1951 Ryder Cup. NARRATOR: Once a deep and powerful connection between two people has been made, no measure of distance nor duration would prevent two legends from reuniting once again. - Hello, Mr. Burke. How you doing? - Willie McRae was so revered by Jackie Burke, when he met him all those years ago, I was just so-- I was so interested and so taken back how much of an impact that Jackie Burke must have had on Willie McRae, because Willie really was-- it was-- it was a very big thing to him. NARRATOR: And as these two men came to meet, the moment of a lifetime was ignited. - We're going to talk about the 1951 Ryder Cup. This is to be the 65th anniversary of the Ryder Cup at Pinehurst. Jackie Burke, Willie McRae. STEVE ELKINGTON: 93 years young, 83 years young. - You two are the only two left living from the 1951 Ryder Cup American team. - You're still coming up Willie. - I got you by 10. - You must have been young when you were caddying for me. - I started-- yeah, I was. I started when I was 10. - 10 years old, yeah. And, uh, I was working on a farm, and I said, Lord, it should be a way that I could get off of this farm, because picking that cotton, you know, my back hurt so bad. I thought, oh, I don't want to be going down that road. So my daddy said, "You want to be a caddy?" I said, "Sure." So he-- I said, "Anything with caddying." I said, "I believe I can do it." NARRATOR: For almost 3/4 of a century, one man's watchful eye and wisdom have graced a course some deem a house of worship. His mind kept sharp. His integrity stood high while he served without complaint. WILLIE MCRAE: I started caddying at 10 years old in May 19, 1933. My daddy said, "Would you love to caddy?" I said, "Yeah, I want to get off of this farm." So I started caddying. And I loved it so good so I said, "Well, this is the best job I ever had." And I enjoyed it. So the first two guys I caddied for were Donald Ross and Richard Tuffs, the two bosses. NARRATOR: And as Willie's inherent abilities echoed down the fairways he walked, so did his allegiance with faith. - You know, I looked at the Village Chapel a long time. I didn't never think I would be in here talking. I always watched the church and thought a lot of the church. And their chimes sound so good when you're out there on the golf course. And I know the pastor do a good job. He have a hard job too because when you're dealing with a lot of people, you're going to have a lot of headache and pains and everything else, but you've got to just hold on to God's unchanging hand and everything will work out. NARRATOR: But little did this devout man know that his worship would lead him down a path of unforgettable guidance. - Everybody is somebody. Regardless of what they've done or what they're going to do, they are somebody. And you've got to treat them like they're somebody. And just like I tell everybody, I don't like nobody, but I love everybody. The Bible said love ye one another. It didn't say nothing about no like. NARRATOR: And as he continues to inspire all, his legacies expose the fruits of his labor. WILLIE MCRAE: Yeah, 1951 had a Ryder Cup here. And, uh, I was 18. We had to draw names. So I draw Fred Daly from across the water. And they called me a traitor. They said, "You a traitor." I said, "Well, listen, I got to caddy for somebody." All America was too tough for us. We couldn't beat them. But we had a good time, and everything worked out good. I was out there with all them older caddies that had been there a long time, but it didn't bother me because it meant a whole lot because, you know, at 18, and you're caddying at a Ryder Cup, you know, a whole lot of people was 40, 50 years old and never had a chance to caddy in the Ryder Cup. NARRATOR: By believing in the plans set forth before him, Willie's beliefs left his life truly blessed. WILLIE MCRAE: My daddy was a caddy. And he caddied for me in a caddy's tournament. And we just had so much fun. So I'm going to have to go back out there and show them what I got. I mean, I still got it, but you know, I might not hit it as far, but I know how to hit it, and when to hit it, and where to hit it so that makes a difference. [SINGING] That's why I said yes, Jesus, love me. - Mr. Burke, 1951, you were only 28 years old. You were the youngest on the Ryder Cup by 10 years. Tell us about a man named Bob Hudson. Hardly anybody in the world knows anything about a man named Bob Hudson. - He was a man in Portland, Oregon. And he had a business of fruit, canned fruit. And he was a good friend of Augusta because Cliff Roberts would buy that fruit and keep it there at Augusta, and we always ate it. But Bob, uh-- but he was one of the United States to play Great Britain in a Ryder Cup match. And he wanted it so much, he put a-- when we finally got it, he put a dinner on it at Waldorf Astoria for 500 people in tuxedos. NARRATOR: Not only was Hudson credited for funding the entire 1947 Ryder Cup, but the grocery store magnate, who was a heck of a golfer himself, was a pivotal player in the success of the 51 matches. As a result, he was named the Golf Writers Association of America's Man of the Year. - So once you guys made the team and you knew that you were going to go to Pinehurst to play the matches, they took everybody to New York City. - Right, to a dinner. STEVE ELKINGTON: To the Waldorf Astoria. - Great Britain, Dai Rees. STEVE ELKINGTON: Dai Rees was a very formal man. STEVE ELKINGTON: What did he do? He gave a big speech. - He gave a very proper speech, as he always has, and he got a round of applause. And then it was my first time to ever even think about Ryder Cup. And I was happy to have Sam Snead on my team. - Sam Snead, of course, was a coach. JACKIE BURKE JR.: He was the captain. So he got off the bus. And he went out there and talked to that man. He said, 'What do you get for plowing this land?' He said, 'I get $8 an hour.' He said, 'I'll give you 10 to plow my place.' And he said, 'I can't do that. I've got a wife.' 'I'll give her 10 too.' He said, 'Say man, ain't you peeing on my leg?'" STEVE ELKINGTON: That was Sam's-- that was Sam Snead's speech? JACKIE BURKE JR.: That was-- that was his speech he gave. STEVE ELKINGTON: At the dinner. JACKIE BURKE JR.: At the dinner, after this very proper thing that Dai Rees did. NARRATOR: Playing Captain Sam Snead led one of the greatest collections of American Ryder Cup players in history as the American bravado played foil to the prim and proper nature of the British side. In addition to Snead, the team members were Ben Hogan, Jimmy Demaret, our own Jackie Burke Jr., Lloyd Mangrum, Skip Alexander, EJ Harrison, Clayton Heafner, Ed Oliver, and Henry Ransom. All told, this team would combine for 386 professional wins, 22 major championships, and 5 future World Golf Hall-of-Famers. - So were you-- was your team-- was the attitude of the team, you, you, you thought they were-- they were stuffy, or are you just didn't-- were kind of, sort of shocked at the way they spoke? - I just wanted to take them out. - That's all I wanted to do. - Fair enough. And you were-- unfortunately, you were on the other team, but you-- I'm sure you were-- you were trying to get your man to win, Fred Daly. - No. I tell you the truth, I was hoping Pinehurst-- United States would win. - Yeah, yeah. But see, everybody was calling me a traitor anyways, you, but see, only reason why I had to be because I had to pull a name. STEVE ELKINGTON: You had to pull a name, and you got Fred Daly. - Yeah. Yeah, but I-- I was with the, uh, uh, American team all the way. STEVE ELKINGTON: Yeah, I could see that, Willie. I don't-- I don't-- I--I-- I don't blame you a bit. - I know I asked you this question before, what did the-- did the British even have a chance that year? What were they thinking when they saw this? This was one of the all time groups of men that could play golf at a really high level. - They were more impressed with their-- the technique and looking good, rather than scoring good. - So that was-- it wasn't much-- it wasn't a super match. - It wasn't a fair match. STEVE ELKINGTON: No, not-- not at that time. NARRATOR: As was the case with most of the early Ryder Cups, the British team was simply outmatched, especially on American soil. Few Britons had even played in America, much less with any success. And only two players had won their crown jewel, the Open Championship. While the Brits split the first four Ryder Cup competitions, they were currently on a four-match losing streak that would balloon to seven by 1957. After that, it would be a quarter century before the Cup return to European soil. - I'm going to talk to Peter Oosterhuis, who played on six Ryder Cups on the other team. And we're going to hear about his-- what the other team was thinking coming around and having to go up against you guys. NARRATOR: In the early '70s, there were few better European tour competitors than London-born Peter Oosterhuis. Is seven European tour wins resulted in a record four-consecutive order-of-merit titles from 1971 to 1974. Oosty's rookie Ryder Cup was in 1971. And throughout his six Ryder cup appearances, it wasn't just his 6 foot 5 inch stature that made him a Goliath to the American side. - I'm in the [INAUDIBLE] singles, and I'm playing Arnold Palmer, and the American side was leading significantly. And we were going on, I think it was on the 14th fairway. And I think I was two up on old Palmer, which I was very pleased with. And it started raining. And Arnold says, "Well, you know, the match is already over. The United States have already won, got enough points. Why don't we walk in?" So I say, "Are you conceding the match?" And he had a big smile, and he said, "Oh, I don't think so. Let's play on." - So I managed to beat Arnold Palmer, which obviously was a very important win for me. - That's-- that's certainly a feather in your cap. NARRATOR: American Ryder Cup lore dubbed him a legend killer, so much so that "The Merry Mex" himself put more than the competition on the line during their 1973 singles match. - They had a team meeting on the, I guess the Saturday night before the last round of the-- the-- of the Ryder Cup. And he had said something to them, that, you know, if I don't be that Oosty, I'm going to-- and I don't know what he said, some rude thing. - I probably should have beaten Trevino. He probably says he should have beaten me. But we halved. And then there was a couple of years later, I had found-- I was shown these pictures of the American team, where he's sitting on a chair, and he's got six or seven American players, including Arnold Palmer and some other big name players, with their slacks around their ankles, waiting for whatever payoff he had promised if he didn't beat me. - Now, Peter, what do you think of it all now? Why is it Europeans now have been successful, in your opinion, recently? - --you really are intimidated. You realize the American side was stronger. That's not necessarily the case these days. So you just play hard and believe in the team. - Of course, now, this year, you know, the-- the-- European team, they're loaded again. So what do you think is going to happen this year? - Well, what do you want me to say? I would say, oh, Europe will win easily. - Europe would win. Europe's going to win easy. - [LAUGHS] No, I'd hope-- no, I don't know that that's going to happen. I would hope it's a very competitive week and everybody has a good time, even have an exciting-- some exciting matches. NARRATOR: Peter Oosterhuis may have been known as Europe's legend killer for his matchplay prowess, but since 2014, Oosty has been behind in his match against a previously unbeaten opponent, Alzheimer's disease. - Losing your memory is-- is not good at all. I mean, I've-- some of the things I can't remember now, you know, I would have remembered for a long, long time, great places I've played, and places I've seen, people I've met. Um, you know, to not to be able to remember all that as well as I should or could, uh, is aggravating. - I went into denial. And I couldn't talk for a while to anyone about it. And then I had to. And I had to face it. And I had to tell people. And nobody else believed it. It's been an amazing journey, um, for us-- a little over two years now. And, um, you know, it's, it's devastating, but you have to deal with it. NARRATOR: Aggravating is not a word anyone would use to describe a man who has been known both as a player and an announcer as the definition of a gentleman. Oosterhuis has faced his most formidable challenge with equal aplomb, even as his memories on and off the course have faded. - Watching one of the most brilliant and articulate golf commentators in the world slowly lose his memory and, uh, his mind, uh, has been devastating to me. But he-- he is still Peter, and I love him, and everybody loves Peter. NARRATOR: One of Oosty's former broadcast partners at CBS, Jim Nantz, lost his father to Alzheimer's in 2008 and started the Nantz National Alzheimer's Center in Houston three years later. The opportunity to help Peter and Ruthie with their struggle by joining forces in the fight to find a cure was a natural. - Jim Nantz came to us, and, uh, he-- he said, "Ruthie, if you would lend Peter's name to this disease, you cannot imagine the money we can raise and the awareness we can spread to people all over the United States and the world." So it was the-- we-- we discussed it for five minutes, and we said, "You're on. Let's do it." NARRATOR: With Peter now in a trial at the CMC Neurological Center in Charlotte, they are a dynamic duo in their match to beat Alzheimer's. Add in Ruthie's determination to overcome their biggest opponent, and anyone would be hard pressed to bet against them. - If they're golf nuts, then they know who I am, and, uh, and they know what I have said about Alzheimer's, and what we're trying to do. And so I'm-- I'm glad people are able to listen to me, that and hopefully somewhere along the line we can figure out how to solve this, uh, Alzheimer's problem. - What was your first impression of Pinehurst? I know you've been there and you love it. - Yeah, well, it was just a-- a course that I had never seen in Texas. I mean, we-- we didn't have courses in Texas that amount to anything. NARRATOR: Bobby Jones once said that Pinehurst, North Carolina is the St. Andrews of American golf. With nine courses on property, including the world-famous Number 2, and 40 other courses in just a 10-mile radius, it's easy to see that this sleepy sandhill village is truly the cradle of American golf. STEVE ELKINGTON: There would be a decent argument to make that the Pinehurst area is the heartbeat of American golf, because it's so popular, there's so much golf to do here. Some of the other arguments would be in the Northeast. So the other argument would be-- would be out in Pebble Beach area. But to me, more of a year round destination, is it's Pinehurst because the town has a heartbeat around golf. NARRATOR: In 1895, Boston soda fountain magnate James Walker Tufts perches almost 6,000 acres of land in the North Carolina Sandhills with the vision of building a health resort for people of modest means. He retained the most famous landscape architect of the day, Frederick Law Olmstead, to design the village. And by 1897, the first golf course was being built. REV. DR. JOHN R. JACOBS: I think that it's unique, certainly in North Carolina, in that it's a place that has drawn people literally from all over the world. And they've come here to retire and to play golf. It's, uh, been called a very well-kept secret, but I don't really think it's a secret, uh, anymore. NARRATOR: Then, in 1900, everything changed with the appointment of a then little known golfer named Donald Ross as the head golf professional. Ross began his course design career at Pinehurst. And that would lead to a lifelong odyssey of golf course design with a portfolio that represents some of the most famous golf courses in the world. Number 2, however, was his crowning achievement, as he lived and worked on the course until his death in 1948. He often said it was the fairest test of major championship golf he ever designed. PETER OOSTERHUIS: Well, it's a super course. It's a-- it's a good-- good course in-- in any situation, whether you're playing stroke play or match play. I've always loved the course. It has a good character to it. And, uh, it's tough. I mean, if you shoot a good score, you know you really played well. NARRATOR: But no matter your handicap, Pinehurst is a must visit for anyone who loves golf. From the luxury accommodations to the village shops and local pubs, Pinehurst is pure golf. And its patrons wouldn't have it any other way. - Everyone talks about golf at Pinehurst all day long. And it's just wonderful. You see people-- you who walk outside right now and there's people from all over the country playing golf. "What course did you play today?" "Number 9. What did you play?" "Number 4. What did you play?" "Oh, we're playing Number 2 tomorrow." They have nine courses here. So Pinehurst has it all. STEVE ELKINGTON: OK, Peter, the format for the secret smackdown is it's a 3-hole match on the course's three best holes. Teams are always selected by me. And the rules are optional. In this case, Peter, mate, it's just me and you. We are out on the famous Pinehurst Number 2 course with the famous Willie McCrae. Willie, this is number 9. - Par 3. Would you be so kind to give us, uh, an idea of how far we have on this hole? - We got to 136 yards to the pin. Play it to the left of the flag, because everything rolls from left to right as it rolls down to the pin. - No, I want to watch exactly what you do. STEVE ELKINGTON: OK. That is a beautiful looking hole. PETER OOSTERHUIS: Sure has great character to it. STEVE ELKINGTON: If you were commentating right now, Oosty, what would you be saying about me if I was getting ready to hit this ball? - You have to make sure you don't leave it to the right. - It's the over-riding thought. - Left of the flag, Willie, huh? WILLIE MCRAE: Left of the flag. You let it go right-- left to right. - It'll come down a little? STEVE ELKINGTON: Well, I did it. I think I did it. Yeah. - OK. Is that coming off the green? PETER OOSTERHUIS: It's still moving. WILLIE MCRAE: Coming off-- back off the green. PETER OOSTERHUIS: It was a good hit, but not quite enough. - Well, I thought I had the advantage in the match just all of a sudden, but now I don't. - Ooh! That might be all right. PETER OOSTERHUIS: Play the right distance. STEVE ELKINGTON: Over there. Oh, well, it looks like that we have succumbed to the typical Pinehurst green, doesn't it? STEVE ELKINGTON: Oh, there's another opening, Oosty. PETER OOSTERHUIS: That green's speedy. PETER OOSTERHUIS: Get up there. PETER OOSTERHUIS: Good stroke. Could easily have gone in. - I hit that nice too. STEVE ELKINGTON: That's OK. It's OK. That's our first hole. We're a little nervous on the first hole of our-- of our Ryder Cup. PETER OOSTERHUIS: Greens are beautiful. Aren't they nice? - You were first off. You were with Clayton Heafner. And you defeated Faulkner and Rees, 5 and 3 in your match. Tell us about, what a guy, uh, Clayton Heafner. - Clayton Heafner was a great golf player. He hated you if you-- if you could putt. STEVE ELKINGTON: But you-- you were on his team. - Well, I know, he was-- he-- but he didn't like anybody making putts because he couldn't putt too good. So we were-- went to the third hole. And he put me off the edge of the green with his second shot. And I got up there and I put that putt in at about 25 feet, and I holed it. And he came over to me and he said, "You knew you could putt, didn't you? You knew you could hole that." I said, "Say, man, I'm on your side." - [LAUGHS] So Willie, you were out with-- uh, it looks to me like you got beat by Sam Snead and Lloyd Mangrum. That was a pretty-- pretty tough-- tough match. You-- but you were out with Hogan and Demaret against Daly and Bousfield. STEVE ELKINGTON: Wow. So there's Willie McRae right there. 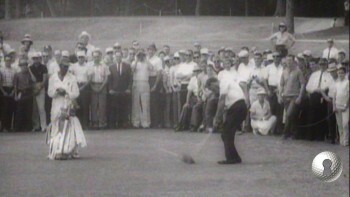 And there's the great Ben Hogan on the tee. STEVE ELKINGTON: Willie, what was it like for you caddying in a group with Ben Hogan? - Three best things when-- when you're caddying is show up, keep up, and shut up. STEVE ELKINGTON: And shut up. - If they don't ask you nothing, don't say nothing. NARRATOR: Jackie Burke's putting prowess continued during Friday's action as he and Clayton Heafner defeated Max Faulkner and Dai Rees 5 and 3. 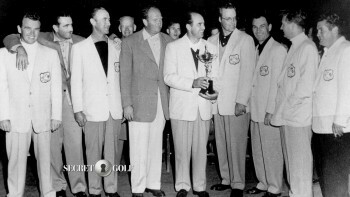 In 1951, the first day consisted of four foursome or alternate shot matches, and the US team won three of those four matches. In addition to Mr. Burke's, victory Sam Snead and Lloyd Mangrum defeated the Scottish duo of Jimmy Adams and John Panton 2 and 1. Meanwhile, as Mr. McRae witnessed, Ben Hogan and Jimmy Demaret defeated Fred Daly and Ken Bousfield 5 and 4. The lone American loss was Ed Oliver and Henry Ransom falling 2 and 1 to Charlie Ward and Arthur Lees. STEVE ELKINGTON: We are on the 11th hole at Pinehurst Number 2 course. Willie McRae told us, in 1951, when he was caddying for Fred Daly in the match with Ben Hogan, Hogan birdied this hole twice. Is that right? - What do we got here, Willie? What do you got here? - That pine tree to the left of the trap down there by the green, that would be a good line. PETER OOSTERHUIS: The pressure is on. You've got to try and find that fairway. And then you have decisions to make on the second shot. - My first impression here, it's-- it's narrow. STEVE ELKINGTON: OK, Peter, I see you're over there on the left side of the tee, are you-- are you thinking about a little draw here? - Well, that's the plan. - People should know that if you are tending to lean towards a draw, you'd want to be on that side of the tee, yeah? - That's right, you give a-- give yourself a little bit more room. - Ooh, I'll take that one. STEVE ELKINGTON: Very nice, Peter. WILLIE MCRAE: That's a golf shot. STEVE ELKINGTON: Even Willie said that he liked that one. I'm over here, I always play a little bit left to right. There's that little fade, Oosty. PETER OOSTERHUIS: Good one. Yeah, a good solid hit. - 234 yards to the pin. - It's living up to its reputation that Ben Hogan liked this hole because it was so difficult. PETER OOSTERHUIS: I was-- I was happy with my tee shot, but it's a long way to go still. The thing is, on a-- on a tough course, you got to be prepared to hit fade, draw, whatever is necessary. - Make the right decision and execute it. It's, if you're on a tough course, then anything can happen. - Do you think Hogan liked this hole because he thought he might be able to win a hole that's very difficult? Probably. It's quite possible. PETER OOSTERHUIS: Yeah, probably, he's not-- yeah, he's going to be less intimidated than the opponent, yeah, yeah. STEVE ELKINGTON: So what are you going to try to do, thread that-- thread that bunker up through the middle there? PETER OOSTERHUIS: Yeah, I'm just going to-- yeah, I'm going-- I'm going-- middle of the green, maybe 10 yards right at the-- the flagstick. PETER OOSTERHUIS: Ooh, just a little too far left. STEVE ELKINGTON: Boy, you hit that nice though, Peter, huh? WILLIE MCRAE: He shot on the trap. STEVE ELKINGTON: Might be a good lay up. WILLIE MCRAE: Hit it about 160, that would be about right. STEVE ELKINGTON: I got a seven. STEVE ELKINGTON: Uh, I pushed it out a little bit, Oosty. PETER OOSTERHUIS: You were scared of that bunker on the left. STEVE ELKINGTON: I didn't want to go into bunker left. STEVE ELKINGTON: I pushed it out on the right. This is pretty typical of Pinehurst. The greens are raised up a little bit. What comes to mind when you first look up there? PETER OOSTERHUIS: And then, yeah, just down into the top of the slope and let it run the rest of the way. STEVE ELKINGTON: Yeah, that came out pretty damn good there, Peter. STEVE ELKINGTON: Oh, wow. So you were only-- you only actually missed your spot by maybe about a yard. PETER OOSTERHUIS: I'm-- I'm very pleased with that result. STEVE ELKINGTON: Hey, Peter, it's good to have a man here that knows what the brakes are, isn't it? STEVE ELKINGTON: What's-- five feet right left, Willie? STEVE ELKINGTON: I might have given it too much. Did I, Willie? PETER OOSTERHUIS: Slow down. Not bad. No, speed was good. STEVE ELKINGTON: It came off left. - I'll give myself that one. STEVE ELKINGTON: Here's-- here's what-- here's what's difficult about Pinehurst. One, two paces-- I'm going to drop this ball. STEVE ELKINGTON: That's going in the sand. - It went over to the other way. PETER OOSTERHUIS: That could have gone in. - That's Pinehurst in a nutshell. PETER OOSTERHUIS: Subtle breaks, absolutely. Absolutely. - So the most unusual thing happened on the second day of play Saturday of the Ryder Cup. You postponed play. And there was a football match played 70 miles away between North Carolina and Tennessee. And Tennessee drummed them, I think, 27 to nothing. Everybody went down to watch the football match. You-- you said-- and Snead-- Snead went way to play an exhibition match on that Saturday. You said you didn't go. But everybody else went down to see the match. ANNOUNCER: At Chapel Hill, with the American and British members of the Ryder Cup golf team looking on, North Carolina plays host to undefeated and untied Tennessee. NARRATOR: Back in 1951, the Ryder Cup did not carry the cachet that it maintains today. So in a truly southern twist, the singles matches were postponed until Sunday. You have to remember, this was Saturday in the fall. And Saturdays in the fall in the South are reserved for college football. So when top-ranked Tennessee rolled into Chapel Hill, North Carolina to play the Tar Heels, all the participants and spectators traveled 70 miles north to take in the game. STEVE ELKINGTON: They skipped a day. They skipped Saturday to go up the road when college football was on. We all love college football, but we don't skip a day in the Ryder Cup to go to a college football game. - That is kind of amazing, considering you're representing your country. That is kind of amazing that happened. I mean, that's a long time ago, but it's certainly, uh, unusual. NARRATOR: Tennessee rolled, 27 nothing. It foreshadowed the route that would take place in Pinehurst the following day. STEVE ELKINGTON: We are on one of the most famous 18th holes in American history. The 18th of the Number 2 Pinehurst Number 2 course. We're tied in the Ryder Cup, you and I. - You've been in this position before. You're a six-time Ryder Cupper for Britain. What are you possibly thinking here, with, uh, you, a lot-- a lot of pressure? - Well, if you've got the-- if you've got the honor coming to this tee, just hit it, down the fairway and put the pressure on, because it's-- it looks a little more narrow than it is, but it's trouble. If you go in the sand to the right, and the rough area to the left, you're going to be lucky to be able find the green with your second shot. - Payne Stewart comes to mind. When Payne Stewart won the US Open here, of course Ryder Cup here 65 years ago, where Hogan and the likes of Demaret and Dai Rees, all those famous players came through. PETER OOSTERHUIS: I like playing holes that all the other men have played. STEVE ELKINGTON: Boy, you do hit it solid too. PETER OOSTERHUIS: Ooh, a bit aggressive. STEVE ELKINGTON: Up the right a little bit. STEVE ELKINGTON: That's got to be it. STEVE ELKINGTON: Take that one, Peter. - A bullet with a great line. - I guess I've got the pressure. I put the pressure back on you, I guess. That's what those boys will be doing in the Ryder Cup. - Trying to put the pressure on them. Nothing beats someone more, whether it's football, golf, swimming, anything is pressure. You put pressure on something-- we know it breaks rocks, we know all those analogies, but in golf, if you put pressure on the opponent all the time, it's-- it's-- the times-- the holes are going to run out, and you're going to win. You just got to-- you got to keep pressure on that opponent. - It's a very, uh, it's a very, uh, precise shot, isn't it? PETER OOSTERHUIS: Go ball, go. Go. STEVE ELKINGTON: You hit that great. PETER OOSTERHUIS: I hit it solid. STEVE ELKINGTON: Great. Good shot, Peter. PETER OOSTERHUIS: Be able to use a putter. STEVE ELKINGTON: Well done. We know that pin is right up on the top. - And I'm going to try to flight it lower so it lands well short and hopefully make it skip up there. That's pretty ambitious. Well, I couldn't have pulled it off better than that. Super contact. Did I get it back there, Willie? Almost. WILLIE MCRAE: I believe you did. PETER OOSTERHUIS: This hole location is very difficult indeed. STEVE ELKINGTON: Well, I'm glad you mentioned the hole location because I've just been informed that that is the exact location of the 1999 US Open that Payne Stewart won. - Well, it was a tough one, no margin for error, just, what, six feet to the right, it would run off the green. STEVE ELKINGTON: What's the line, Willie? WILLIE MCRAE: Want to hit it about six feet left to right. WILLIE MCRAE: Run, run like your souls on-- run like your souls on fire. STEVE ELKINGTON: Boy, you had it on line too. PETER OOSTERHUIS: Mm, just a little bit at the end. STEVE ELKINGTON: Stroke, who's tee? Attaboy. STEVE ELKINGTON: That a boy. - Thank you. And a thank you to Pinehurst, a wonderful place to come play golf. - If you're ever in this neck of the woods, you must visit the old Number 2. - --to-- to complete this Ryder Cup. NARRATOR: Sunday's singles matches results came as no surprise as the US team routed Great Britain. But one man's win would create a Ryder Cup memory for the ages. At 6 foot 2 and 200 plus pounds in the late '40s, seemingly little could sideline or intimidate then PGA tour player Skip Alexander. However, the lone survivor of a tragic plane crash in 1950 left Alexander's hands disfigured, but he remained undaunted to return to the game. After recovering, remarkable Alexander earned a spot on the 1951 Ryder Cup team. On Sunday, when Dutch Harrison took ill, Captain Sam Snead asked Alexander a simple question, "Can you play?" Alexander responded with an equally simple answer, "I can play." Alexander was leery about the prospect of making it 36 holes in prime condition, let alone with the lingering injuries of his past, but with bleeding hands, Alexander pulled off one of the most unlikely and lopsided upsets in Ryder Cup history, beating Vardon trophy winner John Panton 8 and 7. Although Alexander would never win again in the game of golf, he was voted most courageous athlete in 1951 by the Philadelphia sportswriters. Alexander's remarkable victory helped the US retain the Ryder Cup, defeating Great Britain 9.5 to 2.5, bringing to a close a truly memorable competition. - We are in one of the greatest 19th holes possibly in golf. - The Pine Crest Inn. We are paying homage tonight to the great Donald Ross. One of the things they do here, we chip. Hole, please, coming through, playing through. The rule says that if you hit the ball into the hole underneath the Donald Ross, you will have 30 days of good golfing. If you miss, it could be the opposite. PETER OOSTERHUIS: The pressure is on. - The pressure is on. Cheers, gentlemen. Donald Ross, Pinehurst Number 2, Peter Oosterhuis. - --to see the men chip the ball into the hole. It's just go time. - Yeah, you're up, Oosty. PETER OOSTERHUIS: I am? After watching that? STEVE ELKINGTON: Peter Oosterhuis, six times Ryder Cup player for the British team. STEVE ELKINGTON: 30 Years broadcast to CBS Sports. Ben Bridger is the man at Pinehurst. You doing a special grip? - Special grip. Special grip, 10 fingers, Jackie Burke. STEVE ELKINGTON: Oh, you pushed it up a little. 30 days of bad golf. My tobacco road man. He was thinking about bringing his own clubs. STEVE ELKINGTON: Oh, oh, oh, oh, you might of caught a little carpet early there. - That was the problem. - Sir, I seen you've tried to hijack our party here. Who is going to win the Ryder Cup this year? I'm Steve Elkington. - The, uh, uh, Europeans are going to win. - Uh, I'm going to take the Americans. - I'm going to have to go with America. - Why is USA going to win this year? - We're due. We're due. - You know what the Ryder Cup is? - That's right! That's right! That's right! - I'm going to break the trend, Germany. - You're going for Germany? - Yeah, yeah, that's right, whole team. - Yeah, I see it. Thank you, gentlemen. We've hijacked your dinner, but we just had to have that opinion. Thank you very much. - So I was thankful that Pinehurst asked us if we were interested in shooting this story, because Jackie Burke and Willie McRae will not stand together in a room again, probably ever again. And we had Peter Oosterhuis, who gave us some perspective, what it was like to be coming from the British side. - Oh, it was fun, it's always fun about, uh, being reminded about things I did a long time ago. [LAUGHS] Ryder Cups are always special. And-- and tournaments played at Pinehurst were special too. I always-- I always enjoyed it, whatever kind of event it was. So, uh, no, it was-- it was nice. - And I was very worried about Peter because when he has to go play golf his-- he doesn't-- his mind plays tricks on him. And he doesn't want to go because he can't be perfect. And so-- but he went out. And you took him. And he went out. And he had the time of his life yesterday with Steve and, um, Willie. And it was just the best day, the very best day. - Even if I'm at 53, I'm 40 years younger than Jackie Burke. And sometimes I'm like, oh, I'm just getting a little bit old here. And then I think, Jackie Burke is still hitting balls and still practicing. Now, Willie McRae, he's still caddying at Pinehurst. - If you-- if you get up there and open that gate, don't forget me. I'll be coming. - Or I'll-- if-- if I get there ahead of you, I'll have the gate open. NARRATOR: Get inspired as Steve Elkington explores a unique Southern escape. - Savannah is a very mysterious, wonderful place. It has all the fingerprints that were left over from a time before. STEVE ELKINGTON: To me, Dean Martin, Sammy Davis Jr., Frank Sinatra, I just could not imagine being here when they were here. That's just too much for me. NARRATOR: Where he teams up with the locals and gets an insider's scoop on a century old mystery. - See, um, somethings was going on in the Teamsters at that time. They tried to say, well, they had a hit on him. Jimmy Hoffa, yeah. NARRATOR: While hearing a tale few dare to tell. - When the people came back to this side of town, what did they find to their horror? NARRATOR: All this and so much more on another episode of Secret Golf with Steve Elkington. - Blah! Blah, blah, blah, blah, blah! NARRATOR: Secret Golf with Steve Elkington has been a presentation of Secret Golf Incorporated. - Sh. It's a secret.